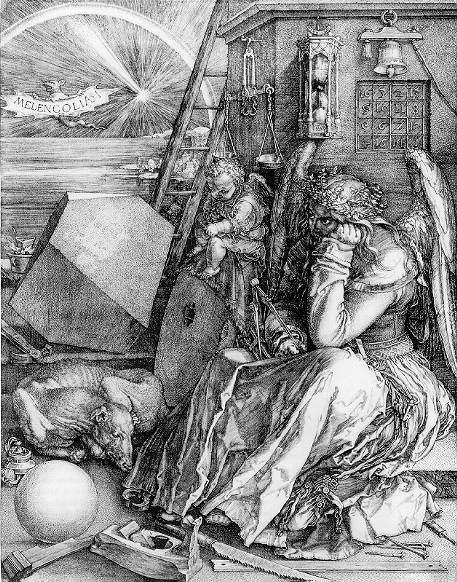 consciousness of the enthusiast community, a result of factors in both the industry and the market. corporate reality of the reacquisition of the Blancpain brand by SMH (now the Swatch Group) is that “growth” of the brand became a necessity. This meant new models, increased production, and of course new and broader marketing. The present market trend to larger, often oversized “sports” watches has been met with the addition of the very popular 2100 and Trilogy models. The 2100, the first line introduced by Blancpain under SMH, combines a large 38mm case with the 100m water resistance rating made popular by Rolex — the standard minimum for “rugged” watches. The more recently introduced Trilogy series attempts to outdo the Rolex Professional line and similar watches, by being the most luxurious instrument-style watches in production. 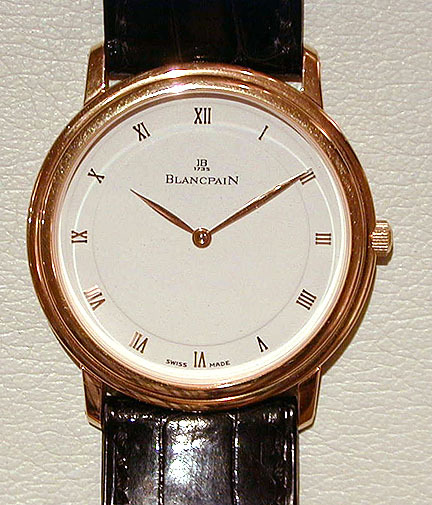 Sadly, with the “Concept 2000″ Trilogy variants, Blancpain does Bvlgari. This seemingly endless stream of new models provides much grist for the mill of watch discussion and consumption, yet I expect that there are a few of us left that prefer the refined over the needlessly large and rugged. It is for us to turn back to the original vision of authentic haute horlogerie encompassed by a small family of six watches. The quantieme a phase de la lune is a classic complication that is not only more accessible than perpetual calendars, but I find that its particular character and symmetry is often more elegant as well. It is appropriate that it is this complication that marked the inception of the modern (but pre-SMH) Blancpain and its purist philosophy. This first model from Blancpain also introduces us to the many advantages of Frederic Piguet’s extensive use of modular construction. For the early edition of this watch the impeccably crafted “complete calendar” module 65 was based on F. Piguet’s 953, a small 9”’ automatic with unidirectional winding (calibre 6595). The introduction of the much more advanced 11”’ automatic in 1988 prompted a redesign using module 65 placed upon the 1153 (calibre 6553). The manually wound version of this watch also uses the 65, but mounted I believe upon the ETA-Peseux 7001 (calibre 6501). A quantieme perpetual was Blancpain’s other initial public offering, and if there is any watch that is the darling of complication connoisseurs, it is the perpetual calendar. The original model has a clean, uncluttered clarity common to many classic perpetuals that dispense with year indication (leap or numeric). It remains the only pure perpetual calendar watch in the Blancpain portfolio. This watch has evolved along similar lines to the complete calendar model. The original module 53 was also based on Piguet’s 953 automatic (calibre 5395), but in this case the adoption of the 1153 as a base movement to replace the 953 also brought the introduction of a more complex perpetual calendar plate with leap year pointer: Module 54 (calibre 5453). This resulted in a watch that is both more complex and advanced technically, but at the steep cost of a retail price nearly 50% higher. temperamental movements within can only be handled by an expert watchmaker. On a personal side note, it was when I was seeking information on Blancpain’s “Ultraslim” that I first discovered Timezone (in 1998). The 9”’ calibre 21 used in the Ultraslim is essentially the venerable calibre 99 advanced from 18,000bph to 21,600bph. The 99/21 could be considered the archetype of ultrathin handwinds, with a history going back to dawn of the wristwatch era (in development from 1911 to 1925). 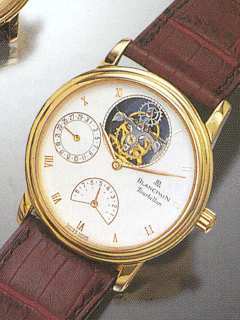 It is also used by Patek Philippe for its ultrathins as calibre 177. The most expensive single complication in the Masterpiece collection, the minute repeater manages to appear to be nothing more than a rather understated, simple thin watch. The slide that activates the repetition function limits the case to being merely “water resistant,” whereas the other five watches of the Masterpiece collection are pressure tested to 30m. I think that the beauty of repeaters lies less in the ringing of hand-tuned notes, than in the elegant design of the calibres and in the craftsmanship lavished upon their construction. 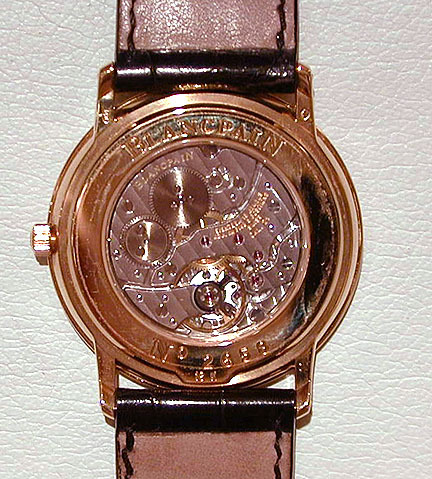 Calibre 33 is a completely traditional hand-wound minute repeater design, very much akin to Lemania’s calibre 399 and the classical repeater designs of Christophe Claret and Renaud et Papi (of Audemars Piguet), which is somewhat odd for Frederic Piguet given their well deserved reputation for innovation. Featuring a screwed balance wheel, overcoil hairspring, and gilding rather than rhodium plating, it hardly seems to be an F. Piguet calibre at all. The rattrapante calibre 1181 and its automatic variant 1186, are the final flower of Piguet chronograph design, and the result of a very large gamble taken by the fledgling Blancpain brand in the creation of a completely new and innovative chronograph calibre. In-depth information on this calibre can be found in the Horologium, or by clicking here. My only objection in the design of Blancpain’s Rattrapante is the inclusion of the date guichet which in my opinion is as out of place here as it would be on the Ultraslim. At least it has been integrated in the least obtrusive way possible. I find it strange that Blancpain’s 1181 and 1186 are the only pure rattrapante watches at this level of manufacture in regular production. The rattrapantes of manufactures like Patek Philippe and Audemars Piguet are limited to being parts of more complicated watches — the 5004 and Grande Complication respectively. This distinction adds yet another feather to Blancpain’s cap. desirable “complication” even it does little for the real world accuracy of a wristwatch. While Blancpain has become a somewhat different company in its new place within the Swatch Group, the original vision of Biver and Piguet lives yet in these rare and little-seen models — the only such complete line of its kind by any brand. They may lack the marketing appeal of trendier, larger watches, but they have a timeless classicism that allows them to be appropriate in any age, century, or millennium. Many thanks to Mike Margolis for his generous assistance. 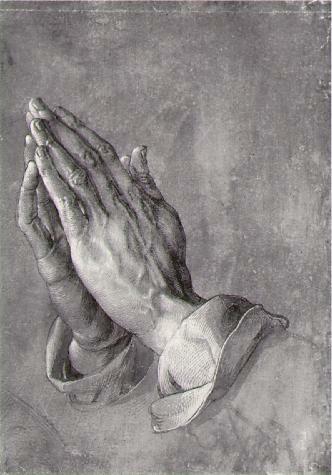 Melancholia I(1516), and Study of Praying Hands (1508), by Albrecht Durer (1471 – 1528); scans by Mark Harden. Ultraslim and calibre 21 by Mike Margolis. 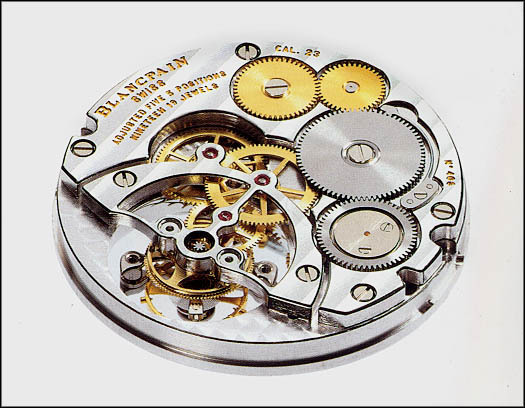 Calibre 23 by Blancpain, S.A.; scan by Walt Odets.